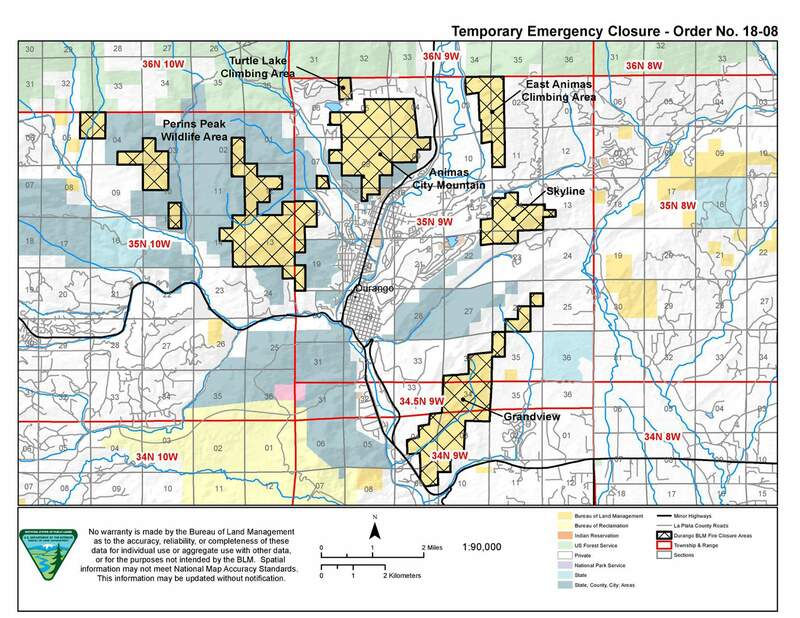 The Bureau of Land Management enacted Stage 3 fire restrictions for all of its lands in La Plata County, effectively closing BLM lands to the public, which follows suit with other agencies that have closed public lands because of the extreme fire danger. The Bureau of Land Management has enacted Stage 3 fire restrictions in La Plata County, effectively closing some of the last open public lands around Durango in response to the extremely high fire danger that persists in the region. The BLM’s announcement closes all recreational uses on Animas City Mountain, Skyline, Grandview and Turtle Lake/East Animas climbing areas, as well as Perins Peak Wildlife Management area. The move to close these areas to the public follows suit with other federal, state and local agencies that have done the same in recent days. Officials hope to prevent another wildland fire outbreak while firefighters tackle two active fires, one north of Durango and another northeast of Dolores. Since Tuesday, the entire San Juan National Forest has been closed, as well as all city- and county-owned open spaces. Officials have said these areas will remain closed until the region receives sufficient rainfall that would alleviate the unprecedented fire danger. The BLM still has open areas it manages around San Juan County, though Stage 2 fire restrictions remain in place there, which prohibit open burning, smoking, target shooting and off-route use of motor vehicles. BLM permit-holders with questions about the closure can call the BLM Tres Rios office at (970) 882-1120.